Recipe from Roxanne Housley, Canyon Ranch Vice President of Sales & Strategic Alliances. 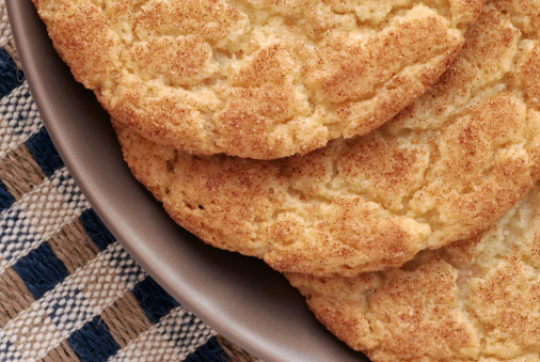 Snickerdoodles are an easy-to-make cookie, perfect for those just starting out in baking. They're popular with both kids and adults. Sinckerdoodles would make a great addition to any party you throw! If you're interested in expanding your customer base, consider selling snickerdoodles at your child's lemonade stand. You'll have a hard time keeping them in stock! Preheat oven to 350 degrees. Lightly coat a baking sheet with canola oil. In a large mixing bowl, mix butter, cream cheese and brown sugar on low speed with an electric mixer. Add egg yolk and vanilla, and mix on low until just combined. Portion heaping teaspoonfuls (or use a 3/4 ounce scoop) onto baking sheet about 1 1/2 inches apart. Sprinkle lightly with cinnamon sugar. Bake for 7 minutes. Lightly flatten cookies with finger. Rotate baking sheet and bake an additional 3 minutes.